Graceland was a hard act to follow, to put it mildly, but four years later, Simon pulled it off by releasing 1990’s The Rhythm of the Saints, an album that built on the world music fusion of his masterpiece but felt like something completely new. I was in my freshmen year of college when The Rhythm of the Saints came out and it was the first Paul Simon album that I bought on its release day. Before that, all of Simon’s music I had inherited or discovered. I spent my high school years familiarizing myself with the Simon and Garfunkel catalog, old classics I’d missed out on growing up. But the idea of new Paul Simon music that was new to the rest of the world, too, was exciting. The Rhythm of the Saints knocked me out right off the bat. I used to play the opening song (and first single), ‘The Obvious child,’ on repeat and I once declared that if I had to pick a soundtrack to the rest of my life, a single song to play on a loop, that would be the one. Silliness, I know, but at the time I really meant it. It’s a really great song. I told my sister and brother-in-law that I felt The Rhythm of the Saints might just be superior to Graceland and they disagreed. Months later, they came around to my opinion and I came around to theirs. I’m curious where they stand on the issue today (and I’m certain the comments will give me the answer). I consider it a close call but give the slight edge to Graceland. My dad latched onto the sleepily lush ‘Further to Fly’ in the way he does on those rare occasions when a song really grabs him (Carly Simon’s rendition of ‘Itsy Bitsy Spider’ is another that got its hooks into him). Apart from my early ‘Obvious Child’ obsession, I fell for the album as a whole. These songs blend together into a tapestry of earthy horns and percussion. It’s the kind of album that’s more rewarding heard all the way through than one song at a time. The song that took the longest to grow on me is today’s Song of the Day, ‘She Moves On,’ and I’ve chosen to highlight it for that reason. It’s a great example of how sometimes the songs that sneak up on you and beat down your defenses become your favorites. I love this song now as much for its poetry as its seductive music. Such great lines here: “My heart still splashes inside my chest,” “her cold coffee eyes,” “we take a walk down in the maroon light.” Simon paints such a vivid portrait of this doomed relationship. 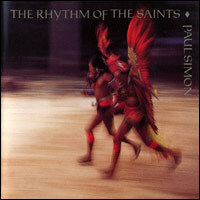 This entry was posted in song of the day and tagged Paul Simon, She Moves On, The Rhythm of the Saints. I recall the debate you mention quite well. And, yes, I did shift my opinion and reluctantly conclude at the time that Rhythm was better than Graceland. I probably still feel that way today, only because I find Rhythm to be a more fluid and lush album as a whole. Still, this debate is a bit like arguing whether Rubber Soul or Revolver is the better Beatles album, or whether Imperial Bedroom or King of America is the better Costello album. The bottom line is that, in each case, the standouts from these artists are so incredible that it is inconceivable to think of really “disparaging” one as the lesser work. The first thing I thought about when I saw your blog was how much Dad loves “Further to Fly”, and of course you mentioned it. I’m not sure I could pick my favorite between Graceland and Rhythm of the Saints, I agree with Dana’s analysis, you simply can’t “disparage one as the lesser work”. I’m loving this theme week! She Moves On is my favorite on the record (today anyway! ).